I read recently with interest an article in the Telegraph, which concluded that dental experts are now advising that after the removal of braces, a retainer should be worn for life to prevent teeth moving out of alignment once they have been straightened. Metal braces – these are the traditional style braces with metal wires and brackets. These braces are fixed and cannot be removed by the patient, but they tend to be less expensive. Ceramic braces – these are similar to metal braces, but the brackets are tooth coloured and therefore blend with the colour of a person’s teeth to make the brace less noticeable. In some cases, the wire can also be tooth coloured to make the brace much less visible. These braces tend to be more expensive than the traditional style metal brace. 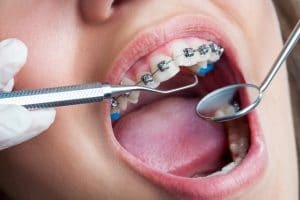 Lingual braces – these braces are the same as the metal braces, but instead the braces are fixed onto the inside of the mouth and therefore the brace will not be visible but this brace will be more expensive. Invisalign – these braces are virtually invisible and consist of custom made plastic retainers. There are no metal wires or brackets and this may make them a lot more comfortable for the patient. However, they cost significantly more than traditional style braces. Typically braces have to be worn from around 18 months up to two years. However, this can vary depending on the type of brace that is selected and the complexity of the dentition. Following the removal of a brace, a patient is provided with a retainer, which is custom made and is used to keep the teeth in place. Patients are encouraged to wear the retainers at night and in between meals. The British Orthodontic Society has launched a new campaign ‘Hold that Smile’ which aims to educate patients that orthodontic retainers should be worn for life. The campaign follows research on relapse carried out in America, which found that 70% of patients who had only worn retainers for one to two years after orthodontic treatment needed re-treatment ten years later. The Campaign is also being supported by the Faulty of General Dental Practice UK and the British Dental Association. For those considering orthodontic work, you should ensure that you seek appropriate advice from an orthodontist. Further, you should be willing to commit to wearing a retainer for life, if you wish to maintain the alignment of your teeth once they have been straightened.